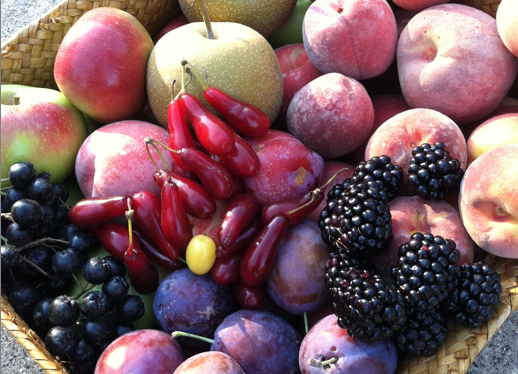 A diverse harvest from the edible landscape including Asian pear, cornelian cherry, blackberry, aronia, and more! Promoting diversity is critical in creating an adaptable and resilient system, whether it be a society at large, a local economy, or in our case— a farm, orchard, or garden. Lack of diversity creates problems and inherent weaknesses. Let examine this by using the agricultural monoculture as an example. In a monoculture, one species dominates a large expanse of land. In the midwest corn occupies thousands of acres. Now, imagine being a corn leaf aphid or a pathogen that infects corn…you’d have a freakin’ heyday! By simply planting in polycultures problem prevention becomes integrated into the system. Crop diversity is critical for any successful farm operation. If you put all of your time, money, and energy into producing one crop and it fails then you’re in the low. Cherry farmers in Traverse City are at major risk of losing 90-100% of this year’s cherry crop. The wise farmer grows apples, cherries, strawberries, and squash. As the old saying goes ‘don’t put all of your eggs in one basket’. Low diversity creates risk, high diversity creates resiliency. The latter of which we aim to optimize in a truly sustainable and biologically sound system. Lets take a look at five major areas of orchard diversity. This simply means maximizing habitat for a wide array of organisms. Instead of creating a biologically sterile environment, aim to create a biologically rich environment. Provide conditions that support a diversity of organisms— plants, animals, fungi, bacteria. And within that support many different types of plants, many different types of beneficial fungi, and so on. By simply allowing the system to function more wholly, the burden of the intervener is greatly reduced. Biology works! Aside from having many different biological life forms, we also want to maximize the genetic diversity within each species complex. If you plant one acre of a genetically identical apple variety, say ‘Golden Delicious’, then any potential problem could wreak havoc on the whole. Decrease the likelihood of disease and pest outbreaks by planting many different cultivars with different levels of pest and disease resistance. In many cases it is neccesary to have SOME genetic diversity for proper pollination. With increasing climatic instability it may be smart to plant varieties with a wide range of chilling hours. What are the primary functions necessary to maintain high orchard health? Fertility management, irrigation, and pest balance just to name a few. The biologically mindful gardener aims to fulfill these functions on-site while minimizing off-site inputs. A splendor ideal. Instead of relying on one source for fertility, mix it up by utilizing mineral accumulating plants, nitrogen fixers, homemade composts, manures, etc. The point is to not rely only a single element to fulfill essential system needs. Redundancy of function is crucial; kudos to permaculture design for ‘every element serves multiple functions and every function is served by multiple elements’. What makes that woodland so pleasing to the eyes? Its not the regimented consistency of structure, because you won’t find that in any natural system! Switch things up by incorporating a mixture of plants with different sizes and forms. Ecologists have proven that ecosystems with a ‘lumpy texture’ foster 2-3 times more species diversity. In food forest theory we refer to there being at least seven spatial layers: tall canopy, medium trees, small trees, shrubs, herbs, ground-covers, and vines. Utilize mother nature’s wisdom by creating structural diversity. Lastly we arrive in due time to temporal diversity! This is where the time element comes in. Here we aim to stack functions and yields in time so that a balanced supply line exists. ‘Feast and famine’ is a familiar phrase to farmers— a glut of peaches all at once followed by a period of no food at all. Plan your orchard so you’ll have a succession of yields ripening throughout the season… berries and small fruit in early summer, stone fruit in mid summer, and pome fruit and nuts in the fall. Also, stack functions successively throughout the season. Create a flowering calendar to ensure a constant nectar supply for beneficial and predatory insects. Managing from a time perspective is complex and takes forethought, but it pays off!